I get so excited driving down towards Norfolk and Suffolk, the area where I spent so many memorable childhood holidays – mainly at the resort of Great Yarmouth. And so Kath and I headed off last Sunday and drove down to Suffolk to the Fritton Country Park, the perfect base for our visits to three schools in the area. our friend and librarian, was waiting to greet us for this our forth visit. The pupils have already read all of my books – except one! The new book – KRUSCHMEISTER, was introduced to them with great excitement. But not before having a chat to Years 1 and 2. It is the job of the Patron of Reading to address ALL of the school. I talked to the ‘little ones’ (some, not so little!) about the book I had written some time ago for the Bluebell Wood Children’s Hospice. The book is entitled The Bravehearts of Bluebell Wood and they loved it. The school were good enough to buy copies of the book and the proceeds go directly to the hospice. Thank you Northfield St Nicholas! After two days of extremely enjoyable workshops with all of KS2, it was time to move on to St Margaret’s Primary, literally one minute further down the road. This was only our second visit and the librarian, Lesley Gooch, had vastly improved the library since she took over just over a year ago. Her library looked fabulous, bright and cheerful and lots of lovely wall murals depicting books and book characters etc. We so enjoyed our presentation of KRUSCHMEISTER, SCABBAJACK and TEN O’ CLOCK CALLER. 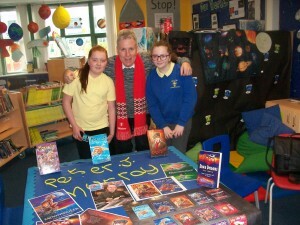 The KS2 audience were brilliant and the following day we signed loads of books for avid fans. My only problem with this school is that I always leave something behind. Last visit I left my glasses; this time I left my laptop! I wonder what I’ll leave next time…maybe Kath! 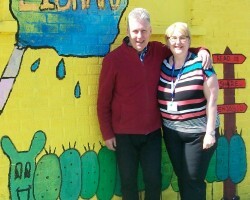 Our third and final visit was up to Great Yarmouth (YEAHHH!) 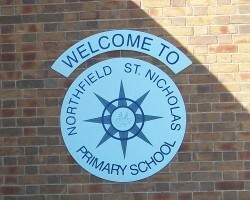 to St Nicholas’ Priory School. We’ve visited this school many times, including the time it was previously a Middle School and a Junior School. Now it’s a thriving Primary Academy and Kath and I were impressed by the appearance and attitude of the near 400 KS2 audience. The presentation was a joy to perform, the vast audience always thoroughly attentive and more than enthusiastic. Tricia Timms, another very keen librarian, had everything spot on regarding organisation and hosting us. She even sent us off afterwards to the best fish and chip restaurant in the town – and weren’t they delicious! It is rare for Kath and I to have a weekend ‘on location’, but we now have two days to rest and chill at Fritton Park Holiday Retreats before our book signing at St Nicholas’ Priory on Monday morning…and who knows – I might even get some fishing in! One thing we’re definitely going to do is to visit the little church in nearby Wickhampton with it’s creepy wall paintings, the inspiration for some of the BONEBREAKER story. In fact this whole atmospheric area inspired my spooky, scary, Saxon – Viking story. We love it here! I intend to keep coming back again and again! Our old house in SCABBAJACK country! We just had enough energy to finish off our Winter school tour at two lovely schools in the North – Bingley Grammar School and Cherry Fold Community Primary. keen to have us in school firing up her Year 7 pupils and this was our second visit. We had a great time performing in front of all the Year 7 pupils followed by a workshop with a selected group. 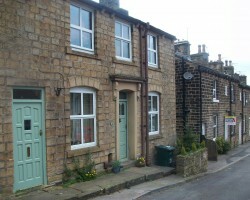 During our Bingley visit we made time to look in at our old house in School Street in the nearby village of Steeton – this is where the very spooky story of SCABBAJACK was inspired. We also visited nearby Skipton and thoroughly enjoyed exploring all the old familiar haunts along the shops and walks in the quaint canal-side setting. And then it was time to sign lots of books at Bingley Grammar before moving on to our last school of the term in Burnley. Cherry Fold Community Primary School (We love the name!) Helen Smith did a fantastic job organising and hosting us – thank you so much, Helen. The staff and pupils were brilliant and made our first visit memorable for all the right reasons. Two of the pupils even interviewed me after the presentation and did a very professional job…and they never even asked how old I am! Thanks for that! 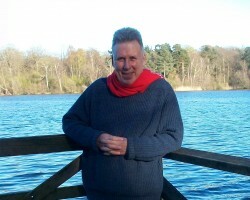 We hope to return to Cherry Fold in the not too distant future and maybe even have our Son, Simon, with us. And now it’s Easter and time to relax…and to get more spooky ideas for more spooky, scary books. Watch this space as they say!